Pudget: Losing Weight On a Budget! : The Healthy Pantry Giveaway and Review! Today I have a wonderful giveaway and review to share with you. I have been so excited the last few weeks because I have been reviewing some wonderful tasting food. I could barely wait to tell you about it. Here is a little information that I received from Keith about The Healthy Pantry. "The Healthy Pantry is revolutionizing the way we prepare food. The average family only has about 20 minutes to prepare meals. And with so little time, what are the options for a delicious, easy, and healthy meal? The solution is easy: delicious recipe kits that help busy families prepare their favorite comfort foods in 10 minutes or less. On average, our meals cost less than $3 per serving— less expensive than take-out or the drive-thru! And the best part: our quick recipe kits are healthy and nutritious." I am going to start my review by telling you about my favorite food from The Healthy Pantry. Seriously, check out these pancakes! Can you see why they are my favorite? Saying they were awesome is an understatement. They were actually the best pancakes I have ever had in my life. You all know that I do honest reviews even when it is hard to write them. So I am not just saying they were the best. They really were that good. I have never tasted a pancake as good as The Healthy Pantry's Whole Grain Apple Cinnamon Pancakes. They had a distinct apple flavor and they were so filling. I ate two of them and I actually had to make myself finish the second one because I was so full. This was definitely a plus. I am so buying these! Click here to check them out. The price is great and they are really worth every penny. Some of my delicious pancakes! Next up is another one of my favorites. The Healthy Pantry's Skillet Lasagna was as good as it looks. 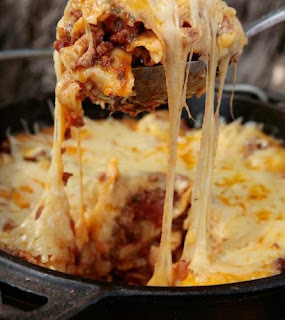 Oh so cheesy and so easy to make since you just put everything in the skillet and let it cook. The best part is that it is make with whole wheat pasta and you can add as little or as much cheese as you want. I added fat free ricotta to mine and it turned out perfect. The whole family enjoyed this one. Click here to find it on The Healthy Pantry's website. Definitely not a bad price for a meal this big and easy to make. This one is my daughters favorite. She loved Ma's Sloppy Joe's! She actually ate 1 and 1/2 sandwiches and wanted more. I had to stop her because I was afraid she would get sick. 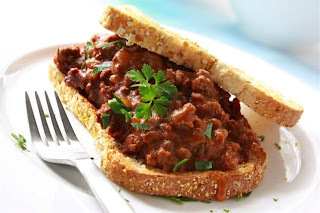 I also enjoyed the Sloppy Joe's but they have a very different taste then I am used to. My family makes our sloppy joe's very sweet so I was a little surprised when I took a bite. That is pleasantly surprised. I really enjoyed the flavor of these and they smelled great while they were cooking. Another benefit of this meal kit is that it also comes with Apple Baked Beans. They were really neat and made my house smell amazing. If you have never tried apple baked beans before you really need to. I think they should make candles that smell this good. :) It was a big meal and my whole family including my parents gave it a thumbs up! The kit I made next was a snack kit and definitely my families favorite. Look at the picture and you can see why. Yum!!! These are Whole Grain Dark Chocolate Chip Cookies. I was shocked by how many cookies this mix makes. If I remember correctly it was supposed to make 24 but I think I must have made them smaller then suggested because I got 36 out of the mix and they were still good sized cookies. Those are mine on the plate. The only problem was that they were so good that I wanted to eat them all. Luckily I had some help. I sent a dozen to my parents and let my husband and kids enjoy them for a few days. I was surprised at how easy they were to make and how good a Whole Grain cookie can taste. They were awesome and I will be buying some in the near future. They will be perfect to have on hand when I need a snack to take to my daughters school or even a last minute picnic. We were all very excited about the price and the taste of these cookies. Click here to check them out on the Healthy Pantry's website. Last but not least was the Cranberry Wild Rice Turkey Stew. The night I made this my house smelled better then it ever has. It smelled and tasted like a stew you would get in a restaurant. The cranberries definitely gave it a wonderful and distinct flavor. I never expected something that has cranberries in it to taste so good. Wow was I surprised! I made mine with chicken instead of turkey because I got chicken at a great price that week. I'm sure the turkey tastes great too. I also made a loaf of homemade wheat potato bread to go with it. It was an excellent combination and a wonderful filling meal. I just think this company is great. Keith, the CEO, is so sweet and personable and he really put his heart into this company. Click here to read about Keith's weight loss journey and how he became a healthier person while starting this wonderful company to help others. Did I mention that they also sell breads, cakes, protein bars and so many others. What do I want to try next? Hmmm? Real Food" Cocoa Cake, Fruit Protein Bars, Pineapple Pepper Meatloaf with Brown Rice, and of course the Wild Salmon Patties with Quinoa and Veggies . Everything looks so good. I can't wait to try more meal kits from The Healthy Pantry. If you are worried about the price don't be. The prices are really reasonable for a meal kit. Although if you are going to order and you want to save a few dollars you can get free shipping by placing an order over $60. Not bad! I really hate paying for shipping so I think this is the route I am going to take when I place my order. And what you all have been waiting for. The GIVEAWAY!!!! There Are Four Ways To Enter to win the Yellowstone River Collection: List all entries as separate comments. 1. Visit The Healthy Pantry and come back and tell me what product you would like to try. Note: It can't be one of the products listed in this post. Winner will be chosen using a random number generator. All entries must be received by Thursday, February 18th, 2010 at 11:59 CST. The winner will be announced Friday, February 19, 2010. The prize will be sent to the winner directly from The Healthy Pantry. I would most like to try the Pineapple Pepper Meatloaf with Brown Rice. I would love to try the Nonna's Sicilian Pasta. I would love to try the Asian Turkey Burgers with Stir Fried Rice. Yummy. I would love to try the Grill Sliders with Apple Baked Beans! The food looks great. I'd love to try the Asian turkey burger with stir fried rice. I would love to try the Cowboy Chili with Blue Corn Muffins. Mmm, what doesn't look good? Those Cinnamon oat pancakes look yummy. But the spicy blackened chicken with calypso rice looks pretty darn good too. Oh yum! The Southwest Chicken potpie sounds delish! Everything looks so yummy! I would love to try the Mac N Cheese. The Grill Sliders with the Apple smoked Baked Beans sound so yummy to me!! This business looks great! The fruit protein bars look great. It all looks so yummy! Chicken Mediterranean with Couscous sounds wonderful. The whole grain dark chocolate chip cookies!! My favorite cookies ever. I'm interested to see if they are really that good. I would try the Asian Turkey Burgers with Stir Fried Rice. Oh my- what a cool company! The 'Real Food Moms' Sampler Pack looks great...and you are right, prices aren't bad! I would most like to try the Dal. OH the asian turkey burgers sound delish! Yum I would like to try the Cowboy Chili with Blue Corn Muffins. That looks amazing. I am jealous of all the yummy foods you got to try! I also subscribe to your blog! I would love to try the Tuscan Tilapia! Yum! Added your link to my blog. I would like to try the Pineapple Pepper Meatloaf with Brown Rice! The cookies are so tempting too! Everything looks really good but i would love to try the mediterranean pasta! I would love the Mac and Cheese and I would add ham chunks to it. I would love to try the Nonna's Sicilian Pasta! I would love to try the Mac and Cheese...mmmm comfort food! Thanks! Yum, I want to try the Dal. This seems like an awesome way to build up the pantry, and it makes 6-8 servings which is awesome. hard to choose just one!! Mini Meatloaves with Blue Cornbread Muffins stuck out to me though...I may just order some regardless of your giveaway - excited to read more of your blog, thank you! I want to try the Real Food Cocoa Cake. The Southwest Chicken Potpie looks so good! I love Dal and would love to try theirs. They all look great, but I'd have to choose the Cowboy Cili with Blue Corn Muffins. I am one of your many followers!